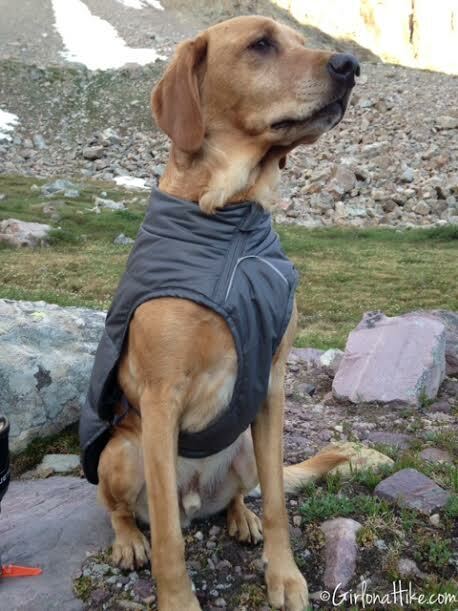 The Ruffwear Quinzee Insulated Dog Jacket is perfect for dogs who backpack and get cold easily. 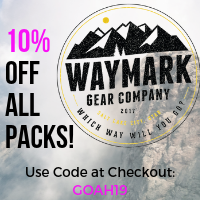 Not only is this jacket super packable at just under 1 pound, it also packs down into it's integrated stuff sack. 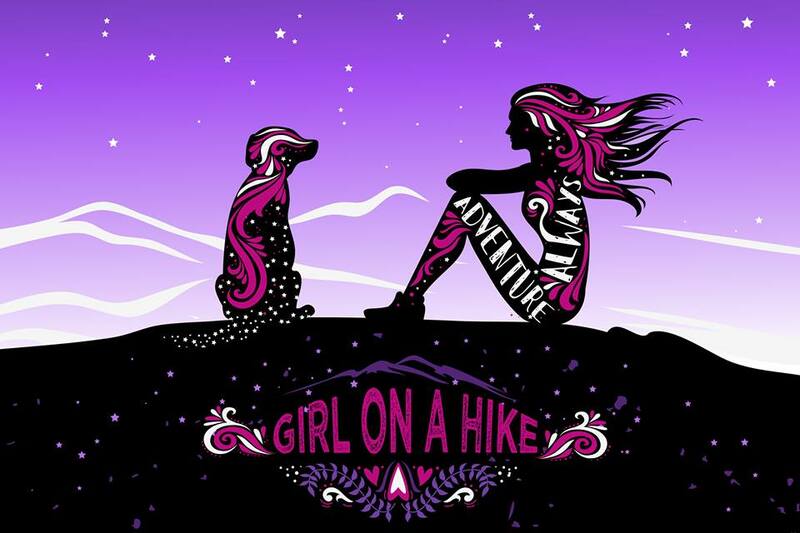 If you like to hike during winter or backpack at higher elevations in cold weather, the Ruffwear Quinzee won't break your back carrying it in, and you dog will thank you for many warm nights to come. Heading into Amethyst Basin in the Uintas, I knew it would get cold at night. 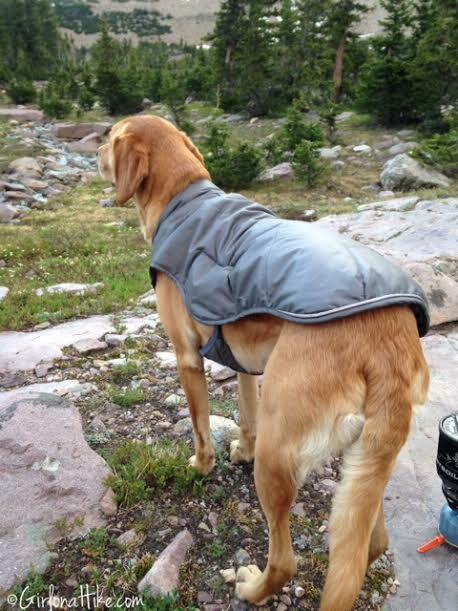 Just a few weeks before, Charlie and I had backpacked to White Pine Lake, and I forgot to pack his Quinzee coat. What I woke up to in the middle of the night was a curled up, shivering dog, inching closer to me as the hours went on. Of course, there wasn't room in my sleeping bag, so I took off my own puffy coat, and placed in on top and over Charlie to help contain heat for him. It seemed to do the job for one night, but I knew I would have to come up with something else. Then it hit me - duh! 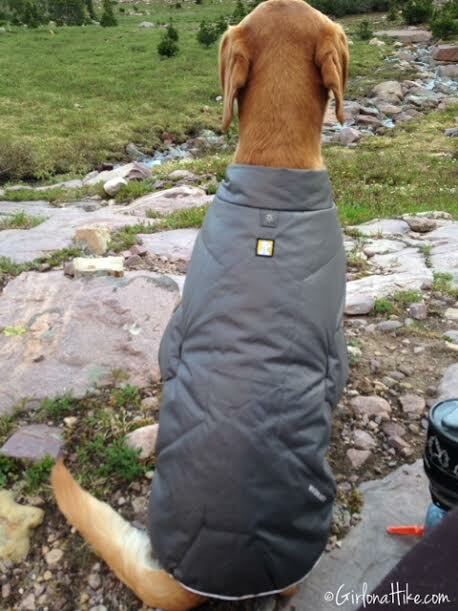 I had his Ruffwear Quinzee coat in winter storage! Once I got home, I found it in Charlie's winter storage box (yes, he has his own box) among several leashes, old collars, and two old dog bowls. Aha! 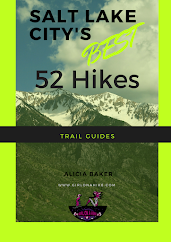 This is just what he needed for our next trip into the High Uintas. We've actually had this coat for about 2 years, and have probably only used it 2-3 times. Now that we've begun to backpack more often, I will definitely be using it more. 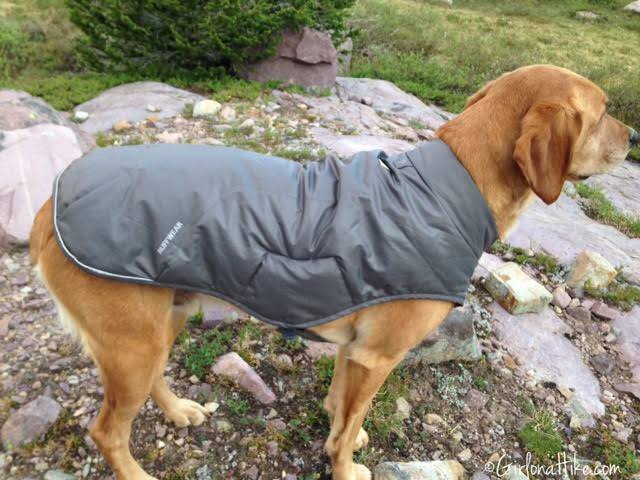 This warm, weather resistant (note: not weatherproof) jacket contains 200-gram synthetic insulation and polyester fabric to help keep your pup warm in cold nights. It's basically a puffy coat for your dog. 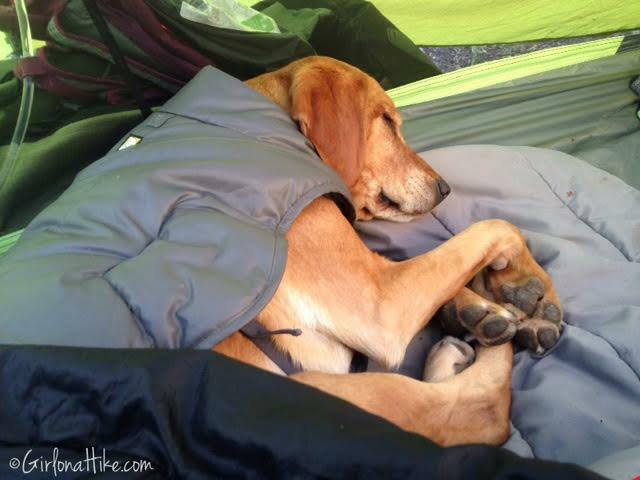 A puffy coat helps keep you warm at night, so why shouldn't your dog have one too? 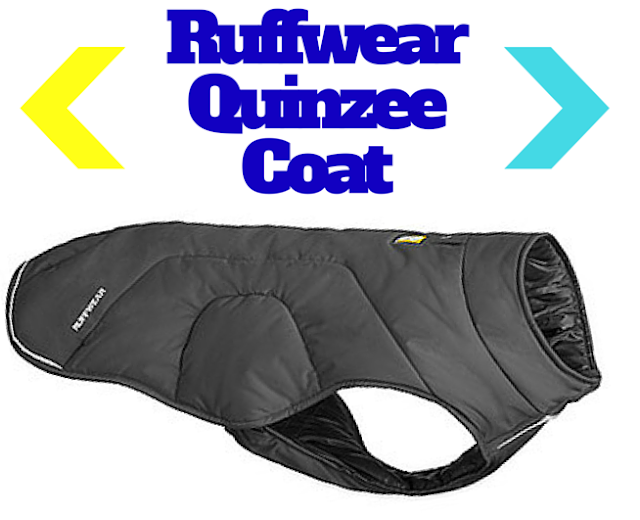 The Ruffwear Quinzee coat is a "vest" style, which provides for easy on/off, and all around coverage. 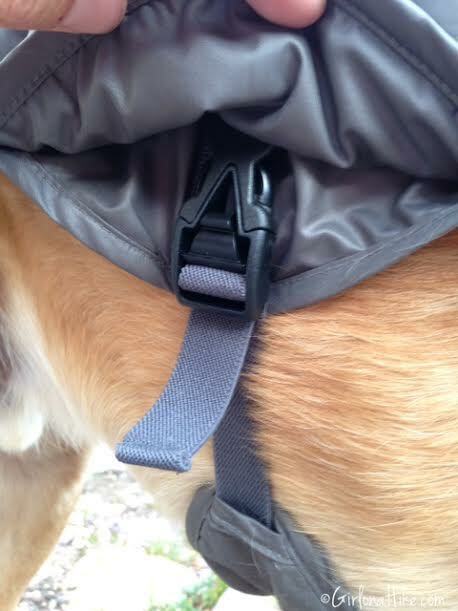 There is a small, 3-4 in zipper in the front to help get it over your dogs head, then zip shut so it won't slip off. The zipper helps to provide a custom fit for different types of dogs and dog shapes. Just like human puffy coats - the coat needs to fit properly to insure the most warmth and comfort. 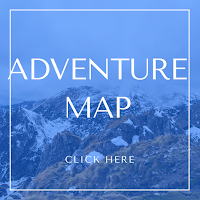 The coat is lined with reflective trim near the end of the coat, so if you take your dog running at night, or like to do night hikes, a headlight or car light would be able to see your dog. The coat easily clips in under these hidden flaps, located on both sides of the coat. You can tighten them to your dogs girth, again, for the best fit possible. 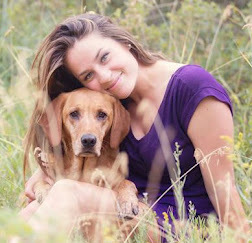 You'll want to measure the widest part of your dogs belly (or girth) to know what size to buy. Charlie is 70 lbs, and wears an XL, which fits a girth of 36-42 inches. If your dog is a chewer, beware of purchasing this coat, which sells for $80.00. I have heard that dogs who like to chew everything, will also chew this to pieces - and there's no money back guarantee for chewers. One downside to this coat is that there is no hook for a leash on the actual jacket, which makes sense for the delicate material. You'll need to have a collar on to attach a leash. A harness would probably fit over the coat. Finally asleep in his warm coat. After backpacking, Charlie is usually dirty and needs a bath. The great thing with this coat, is it's machine washable in cold water, which you can then hang dry. Overall the Ruffwear Quinzee Insulated Dog Jacket is a great buy, and will last a long time, as long as its well taken care of. If you frequently backpack with your dog or like to hike in Winter, this jacket will keep your pup warm for days to come.